What Exactly is a Stabilizer, Anyway? Embroidery machines just keep getting better all the time. Larger, interchangeable hoops, automatic thread cutters, and advanced software make embroidery even more accessible and results even more professional. But no matter how advanced your machine is, many people would argue the secret of success lies in your choice of the right stabilizer. With so many stabilizers available it can be hard to choose which is the right one for each project. As the name suggests, stabilizer keeps your fabric more stable and prevents it from moving about, puckering or stretching as you embroider. If you are new to machine embroidery or simply confused by the variety of stabilizers available, you have come to the right place. By the end of this guide you will be able to pick the right stabilizer for your future projects with ease. When choosing a stabilizer there are several key variables of your project, you should consider. Although some embroiderers would argue you can use one backing or stabilizer for all, speciality backings will improve the quality and durability of specific projects. 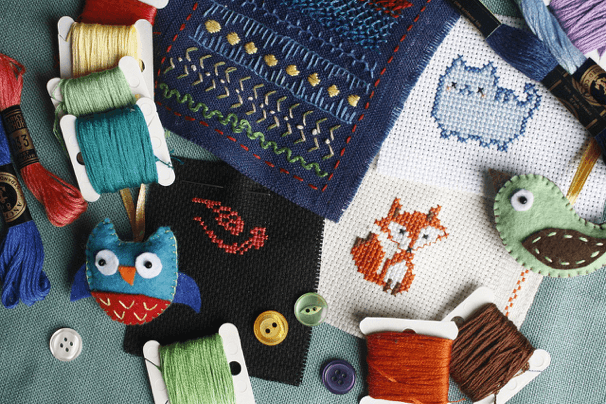 Let’s look at the main factors you should look for when choosing a stabilizer for different machine embroidery projects. The fabric you use is perhaps the most important factor when choosing a the most suitable stabilizer for your project. Knitted fabrics like sweaters or sweatshirts can be slippery under the embroidery needle and need stabilizing more. A cut-away stabilizer tends to perform better rather than a tear-away which may simply tear under the pressure of the extra movement. We will look at the main types of stabilizers later so you can better understand the pros and cons of each. Another factor which can affect your choice of stabilizer is the weight of the fabric. Your stabilizer should be a comparable weight to the fabric it is being used on. Heavier fabrics like denim will need a heavy duty backing while lighter and more drape like fabrics will need backing with lighter stabilizers. Certain fabrics like a sheer cloth fabric will need very lightweight backings that can easily be removed so as not leave any trace. In cases like this a water-soluble stabilizer is recommended. Another key factor to consider is the choice of embroidery design. The basic rule is the more complex or intricate a design is, the heavier the stabilizer needs to be. The more stitches used, a heavier stabilizer will help keep the fabric intact. 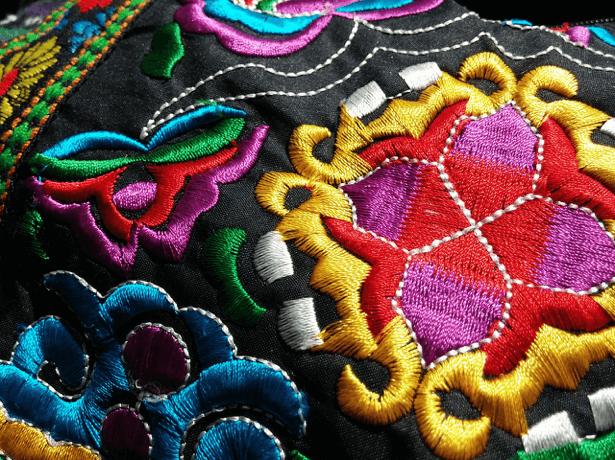 The larger a design, especially with complex digitized designs, a stabilizer will give more stability to the fabric and support to the embroidered design. A solid stitch-filled design will benefit most from a medium weight cutaway. A light running stitch design may get the best results with a sheer mesh cutaway stabilizer (or in some cases a tear-away). The selection of the best stabilizer for your project also depends on the final look you require. If you want a completely clean finish with no remnants of the stabilizer showing you will need a water or heat soluble stabilizer. With other stabilizers, like cut-aways, some stabilizer material remains with only the excess side pieces removed. The remaining backing can provide extra support for the stitching but most people find it unsightly on the final garment. Tear-away backings are a good compromise with most of the stabilizer removed after the embroidery but in more complex parts some support remaining. Before we move on to the different types of stabilizers, a quick note. Although all the rules we have discussed can help you to choose the correct stabilizer, opinions vary greatly on when you should use different stabilizers. These are very general tips that don’t take into account every type of fabric, embroidery design or stabilizers available. The type of machine, needles, threads and hoops will all play a part in the success of your embroidery results. Use the guidelines in this article as a starting point and experiment. And then experiment more! If you decide to work with a fabric, design or stabilizer you haven’t used before, give it a trial run before starting on your actual project. The guidelines in this article will help you to make better choices between designs, fabrics and which stabilizer to use. We have already looked at some of the more important considerations when choosing a stabilizer, now let’s go through the four main types of stabilizers to help you better understand the differences. Each type of stabilizer is available in different weights and you can also choose whether its is sticky, fusible or non-adhesive. Let’s take a more detailed look at each. By far the most common embroidery machine stabilizer is cut-away which can be used with any fabric which has some stretch in it. Knitted fabrics like those used in t-shirts, polo shirts or golf shirts need the support of cut-away stabilizer. Fabrics which are loose woven, stretch like denim or twill and/or contain Lycra or Spandex should use cut-away stabilizer when being embroidered. Other garments include swimwear, fleeces or sweatshirts and anything where there is a dense embroidered design. Cut-away stabilizers are permanent, stretch resistant and remain on the fabric for the life of the design. They are the most stable type of backing with the stronger support preventing stitches from hugging together or the fabric bunching up. As the name suggests, any excess stabilizer is cut away at the sides and the remaining backing offers support to the garment when laundered or being worn. You can get cut-aways in a range of weights from a heavyweight for dense embroidery designs to a lightweight mesh style for a lighter stitch density. One of our favorite heavyweight cut-away stabilizers is the OESD HeavyWeight 2.5 oz. 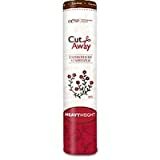 Cut-Away Stabilizer which can be easily found at many speciality shops or online retailers. OESD stabilizers are known not to stretch in any direction to ensure better quality embroidery. Available in black or white this is a good choice for knits or woven fabrics where the extra weight will prevent pulling or sagged stitches. For more intricate or stitch heavy designs you can use several layers to prevent outline issues. For more lightweight fabrics or where the design has a lighter stitch density, we recommend Sulky Of America Cut Away Soft N Sheer Stabilizer. Soft ‘n’ Sheer is a permanent cut-away stabilizer which is made from a non-woven nylon that also promises to be soft on the skin. This is is the ideal stabilizer to use for those baby jumpsuits or other lightweight projects. For fabrics that can easily crush or be marked by an embroidery hoop like velvet you should only hoop the stabilizer and spray it with a temporary fabric adhesive before positioning the fabric on the hooped stabilizer. 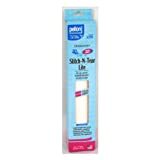 For sturdier materials that can stand needles or pins, either baste or pin the fabric to the stabilizer ensuring you keep any pins or stitches out of the design area. When your embroidery process is finished, simply rough cut away any excess stabilizer from the sides of the design. Use some sharp embroidery sheers for a more precision cutting closer to the stitches. The main disadvantage of cut-away stabilizers is there will always be some remnants of the stabilizer left behind–this won’t matter too much on embroidered pictures or heavyweight garments but could be a problem on lighter clothes. Tear-away stabilizers offer more of a temporary backing for your embroidery designs. They tend to be easier to remove but you should be careful not to pull or stretch the fabric as you do. Many of the stabilizers will tear more easily than others and some may tear better in one direction than the other. A tear-away we recommend is the Pellon Stitch ‘N Tear which will pull away from your design in all directions easily. Tear-away stabilizers are best used on woven fabrics that have no stretch like quilted fabrics, 100 percent cotton, poly cotton fabrics, linen, vinyl, leather and towels. You gently tear the stabilizer away from the stitches rather than into the stitch. Again you get a choice of weights, with heavyweight stabilizers more suited to stitch intensive projects and lightweight available for use on lightweight fabrics with a low count stitch. Medium weight tear-away stabilizers are available in black which are ideal for use on darker fabrics. Tear-aways give a cleaner finished look without any major tell-tale signs of backing like cut-away stabilizers but offer less support and are best used on more rigid fabrics. Some tear-aways are used on the top side of the design to prevent the stitches getting lost in the finish of the fabric. Toppings are normally a plastic-like film like the Sulky of America Totally Stable Iron-on Tear-Away Stabilizer. This iron-on see-through stabilizer fuses to the fabric in seconds to prevent any annoying shifting or sliding of the material as you embroider your design. The excess will tear away when you finish, leaving no sticky bits behind. Tear-away stabilizers are pretty similar to cut-aways in how you apply them, it’s the removal where the main difference lies with all stabilizers, hence the names. We recommend that you gently remove any excess by tearing all directions away from the stitches to avoid pulling before using a small pair of scissors to score away any smaller pieces that may be left behind. 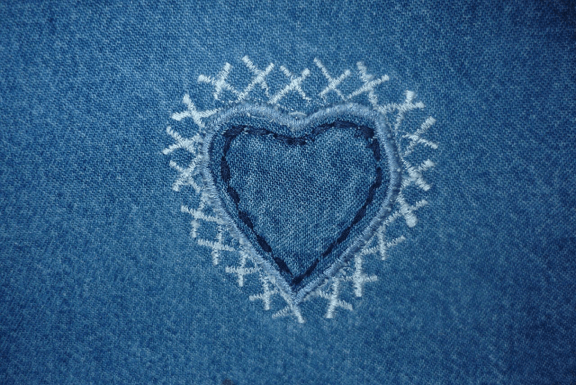 Mostly we recommend that tear-aways are used for in-hoop designs or more open designs on heavier fabrics like denim. The back of the design will look neater but the support won’t be as strong as the cut-away stabilizers as previously mentioned. 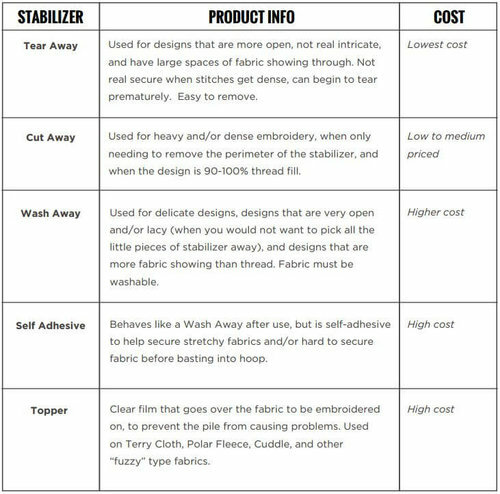 If you want to ensure there are no traces of the backing, or more importantly topping, stabilizer left, wash-away stabilizers are the solution. They come in either a plastic or mesh form and are designed to wash away from the fabric–just ensure the fabric is washable before applying the stabilizer. The strength of support offered by a water-soluble stabilizer is significantly less than cut-away or tear-away stabilizers and they can’t support as complex designs. If you are stitching on something like terry cloth or a sweater knit you can use a wash-away stabilizer on the top of the fabric with a cut-away or tear-away at the back of the design to keep the fabric from showing through the stitches. 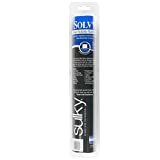 A product like the Sulky 486-12 12-Inch by 9-Yard Solvy Water Soluble Stabilizer Roll would be a good choice to use a design template or stitch guide on the top of such fabrics. The main downside with wash-away stabilizers like this is humidity. In warmer weather conditions as soon as my fingers start to perspire the topping dissolves all too easily. 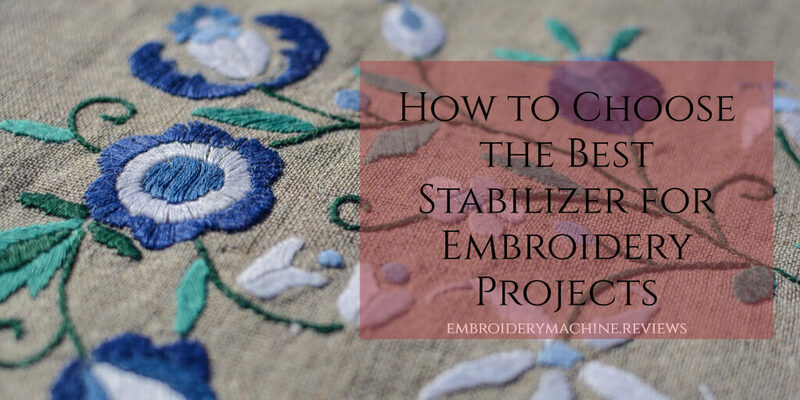 You normally apply the stabilizer to the top of your fabric during the embroidery process. They range from very lightweight web like meshes (to prevent stitches from sinking into the finish of the garment) to transparent films which although still lightweight will require more water for removal. 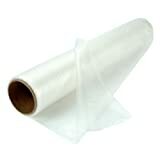 Water soluble fabric that looks like sheer fabric but totally washes away are also available. It’s recommended that you remove the stabilizer manually before machine washing any clothing items. You can either soak the fabric in cold water, best for heavyweight stabilizers, or spray with a mist bottle for more lightweight webs or fabrics. Stabilizers that have used an adhesive may require gently massaging under a running tap. For those fabrics which can’t be washed, like velvet, satin or lace, these work in a similar way to wash-away or water-soluble stabilizers. Lace work in particular is well suited to heat-aways where other stabilizers may not be delicate enough. Melt Away – Heat Dissolving Machine Embroidery Stabilizer Topping Film is a product that disintegrates when heat is applied and easily brushes away. When removing the stabilizer with an electric iron, ensure not to use the steam setting as it can leave stains and may also damage the garment too. 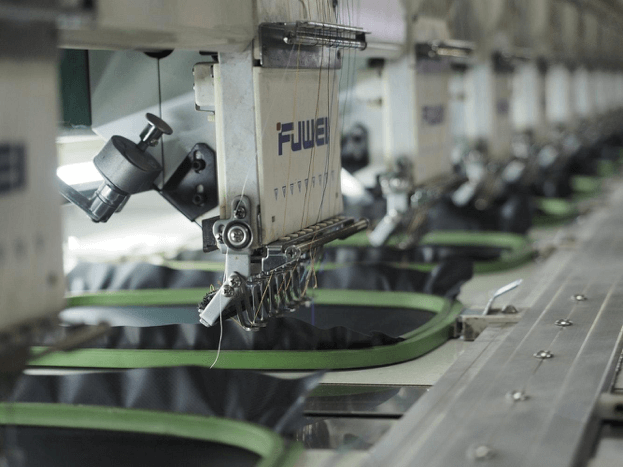 And weather or the heat of a machine can often play havoc with a heat-away stabilizer often removing it mid-embroidery or getting stuck to the needles. Choosing the correct stabilizer for an embroidery project can be a tricky task but will make all the difference to your end results. Rather than loose or stray stitches you will finish with a more professional design. As a general rule for products with more stretch to them use a cut-away stabilizer, more rigid fabrics can use a tear-away for less backing to remain and wash-away or heat-away should be used when you don’t want any remaining bits left showing. Try to keep a selection of stabilizers in your stock as you will find some combinations work better than others. What may work for one person, won’t necessarily work for you. As we said earlier, experiment and find the best combination for your needs. Bu choosing the correct match you can impress all your friends and colleagues with your gorgeous handiwork.